Of course there are formal cultural greek activities as well: museums that shouldn't be missed, magnificent medieval mansions and castles in greece, as well as the great ancient sites dating from the Neolithic, Bronze Age, Minoan, Classical, Hellenistic, Roman and Byzantine eras. Greece hosts some excellent summer Greek festivals too, bringing international theatre, dance and musical groups to perform in ancient theatres, as well as castle courtyards and more contemporary venues in coastal and island resorts. Crete is Greece's largest island, the fifth largest in the entire Mediterranean and the most southern region of the European Union. It lies south of the Aegean Sea, enjoying a privileged geographical position between three continents - Europe, Africa and Asia. The island has an area of 8,261 square kilometers and a coastline that stretches for 1,046 kilometres. Long and thin, it extends 260 kilometres from west to east, varying in width from about 60 kilometres in the centre of the island to just 12 kilometres at its narrowest near Ierapetra in the east. Mountain ranges, snow-crested during much of the year, stretch from west to east, forming the 'backbone' of the island: the White Mountains, rising to 8,045 ft., Mount Idhi or Psiloritis (8,058 ft.), the Dhikti Mountains (7,047 ft.) and the Sitia Mountains (4,843 ft.). The most notable plains are those of Messara and Chania, while a number of smaller ones are located between mountain ranges and hills. The narrow length of the island, its rock types and relatively low rainfall has not favored the formation of significant rivers. The main ones are the Keritis or Platanias, the Anapodharis, the Mylopotamos and the Yeropotamos . Administratively, Crete is divided into the four prefectures of Chania (capital Chania) in the west, Rethymno (capital Rethymno) and Heraklion (capital Heraklion) in the centre and Lassithi (capital Aghios Nikolaos) in the east. 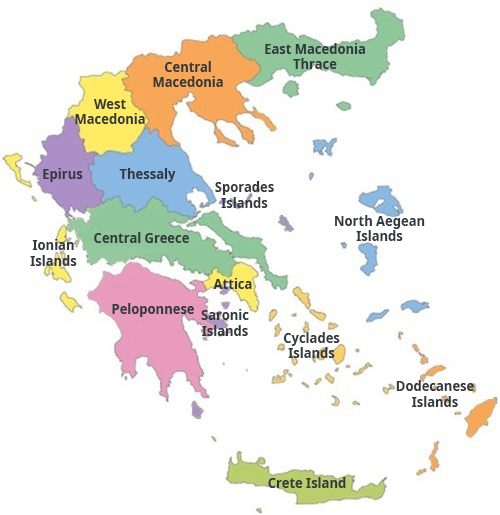 The Cyclades group comprises some hundreds of islands and islets of which 33 are inhabited. These form one of the most attractive groups of islands to be found anywhere in the world, with some 200 easily accessible beaches and countless more secluded and more difficult to get to. As they are small and closely grouped, the Cyclades are ideal for an island-hopping holiday under bright sunshine and azure waters. Their name derives from the ancient Greek belief that they were laid in a circle around the sacred island of Delos, where Apollo and Artemis were born. The first inhabitants according to Greek mythology settled here in 5000 BC, while Phoenicians colonists, who arrive and settled here around 3000BC, signaled the impressive Cycladic civilization. The famous Cycladic marble status were sculptured during the Early Cycladic period, 3000-2000 BC, when people here lived in houses, built boats and mined obsidian and exported it throughout the Mediterranean. The Minoans occupied the islands in the Middle Cycladic period, 2000-1500 BC, and the Mycenaeans around the 15th century, at the beginning of the Late Cycladic period. Cyclades became very prosperous after the arrival of the Romans in 190 BC. Their decline begun with the arrival of the Franks, who gave the islands to Venice. Then came the Turks, in 1453, which virtually opened the doors of Cyclades to pirates. In an effort to disorientate attackers, the local architecture devised the labyrinthine town-planning with narrow streets, which is the main feature in most towns. The islands were revived by the tourism boom that begun in 1970s, after the world ?discoveredû their natural beauty, with their dazzling white buildings and bright-blue church domes, unusual landscapes, mild and pleasant climate with long periods of sunshine and strong winds to keep down the heat, sandy beaches, caves, traditional customs and architecture. Some of the Cyclades, such as Mykonos, Santorini, Paros and Ios, have vigorously developed into tourist industry; others, such as Andros, Tinos, Kea, Kythnos, Serifos and Sifnos, are visited less frequently by foreigners but are favourites with local holidaymakers. All of islands are easily accessible by boat from Piraeus and Rafina, while some can be reached by air, with both domestic and charter flights from Europe. The Peloponnese is one of the largest geographical areas in the country, joined to the mainland by bridges spanning the Corinth canal and bound by the Aegean and Ionian sea in the east and west respectively, and by the gulfs of Patras and Corinth on its northern coast. The entire region, Greece's southern peninsula and the southernmost section of the Balkan peninsula, is of outstanding beauty, with lofty, snow-crested mountains, valleys of citrus groves and cypress trees, cool springs and many fine beaches. It has a rich history and an exceptionally diverse landscape dotted with the legacies of the many civilisations which took root in the region: ancient Greek sites, crumbling Byzantine cities and Frankish and Venetian fortresses. Packed into its north-eastern corner are the ancient sites of Epidaurus, Corinth and Mycenae. The ghostly, capacious Byzantine city of Mystras clambers up the slopes of Mt Taygetos, its winding paths and stairways leading to deserted palaces and fresco-adorned churches. Further south, one can explore the rugged Mani peninsula, a region of bleak mountains and barren landscapes broken only by austere and imposing stone towers, mostly abandoned but still standing sentinel over the region. Other attractions in the region include ancient Olympia, the beautiful medieval town of Monemvasia and the thrilling Diakofto-Kalavryta rack-and-pinion railway, which rollercoasts its way through the deep Vouraikos Gorge. Located on the northeastern edge of Greece, the region encompasses three prefectures on Thrace and two on Eastern Macedonia. Bestowed with the most hydro-biotopes in Greece protected by the European Union, offers sanctuary to rare and rotected bird species. The region's southern Aegean coastline is dotted with vast sweeps of crystal-clear sandy beaches, as well as with rocky coves ideal for fishing and diving. Considered to be the most mountainous region in the country, Central Greece lies in the heart of the mainland. Its geographical position accounts for its great climatic variety, dry on the mountainous inland and mild on the coast. The contours of its landscape, too, are very diverse; thickly wooded green slopes, hills with pines, oaks, poplars and fast-moving streams separated by flat lands, plateaus and lakes, alternating harmoniously with the countless bays, intricate network of coves and picturesque islands decorating the southwest coast. 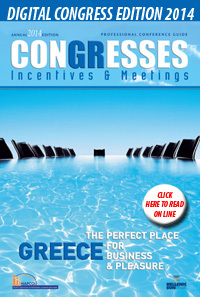 CRETE is one of most popular Conferences Destinations in Greece.